This is a fun, casual outdoor picnic on a blanket in a popular park. Guests will taste a selection of complimentary wines paired with a variety of picnic foods like chicken, sliced meats, cheeses and fruit. The location is at LA County Museum of Art (LACMA) during its popular Friday night jazz concert series. So you get an amazing live jazz concert in the background as we enjoy the food, company, setting and learn about wine. We do wine pairings with a variety of food items (that vary weekly due to seasonality, client food preferences (vegetarian/vegan, etc.). Non-drinkers and children are welcome as I can prepare fun-fruity non-alcoholic drinks especially for them so they can enjoy the picnic too! Please feel free to visit/enjoy this world-renown museum before our event begins. Don't forget to take pictures at the famous LACMA lights! 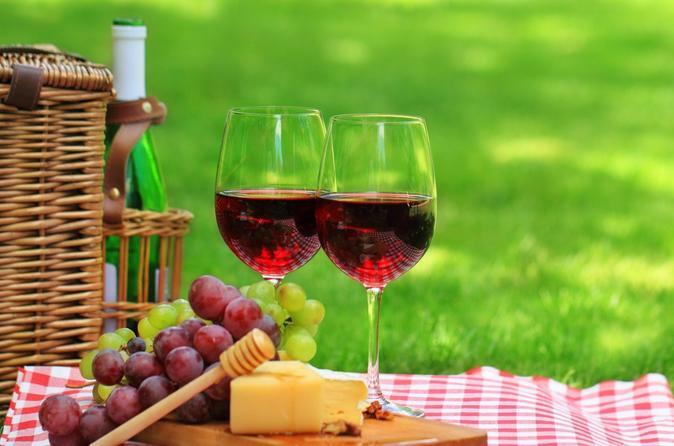 We will enjoy an outdoor picnic + complimentary premium wine tasting of French and Napa California luxury wines with a live jazz concert in the background. We’ll sit on blankets under the sun and stars as we enjoy the L.A. weather. We’ll taste a selection of wines from an esteemed collection of 26 award-winning wineries that span 17 generations of winemaking. These rare, small production wines will be paired with an assortment of meats, cheeses, crackers, fruit, nuts and/or chocolate. This is a fun, casual sit-down educational wine tasting. No prior wine experience is needed. You will learn time-tested wine tasting techniques to increase your wine enjoyment. You will also learn about food and wine pairings, wine regions, and wine styles.Please plan to arrive by 5:30pm to avoid missing any wines during the guided tasting. On Fridays, the music is a live jazz band that plays from 6-8pm. Our picnic wraps up under the stars by 8:30pm. There is additional food, refreshments and alcoholic beverages available for purchase onsite at the museum. Parking is available in the garage off 6th street $16 or there is also free and metered street parking ($1/hr).All the fun takes place outside, so please bring sunscreen, bottled water, and a hat. L.A. gets cool at night, so bring a jacket. You’ll be responsible for your transportation to and from the museum. Complimentary Wine Flight: I always bring a bottle of sparkling wine, white wine & red wine. More guests=I bring more types of wine! I have 150 options in our collection. Concert Access Since the live music concert is free to all, I'll arrive early to make sure we get a great spot. Blankets, trays, ambiance: I will provide glasses, plates, blankets, and trays so we can relax while we taste wine and listen to the music. Food: Meats, assorted cheeses, crackers, fruit, and chocolate (weather permitting). Also, vegan/vegetarian options are available upon advance request. About your Host, Tiffany: I’m a Wine Ambassador for an award-winning collection of 26 wineries based in Burgundy, France and Napa Valley, California. We are the #1 wine exporter in Burgundy, the #3 wine producer in France, & in the top 25 in the US. I'll be leading the wine tasting and wine education. I have over 15 years of experience working in the food, beverage, and hospitality industries both in the U.S. and internationally. I have also been a guest chef on the Rachael Ray show.